My experience with minersource.net starts now! Previous blog I mentioned that I turned off all my old mining equipment, which included a few BFL, and 36 GPUs total, and off course the CPU and motherboard. I will be selling all these items on ebay in the next coming weeks with a plan. Sel refurbish 3-4 items a day, and post on ebay. So my journey starts now! 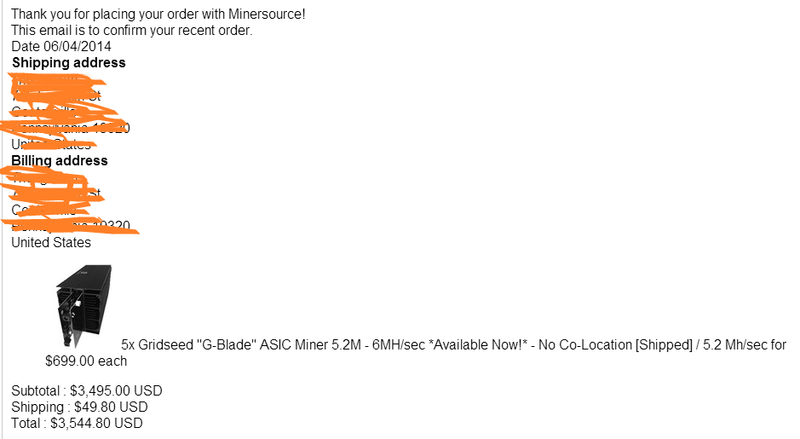 I’ve heard of minersource.net for a long time already, and been on its websites many many times, and even pre-purchased some item but I never really follow through because of skeptical of Bitcoin price value and mining profitability, on top of that will minersource.net delivery, not like BFL Butterfly Lab over 6 months preorder but nothing shipped. 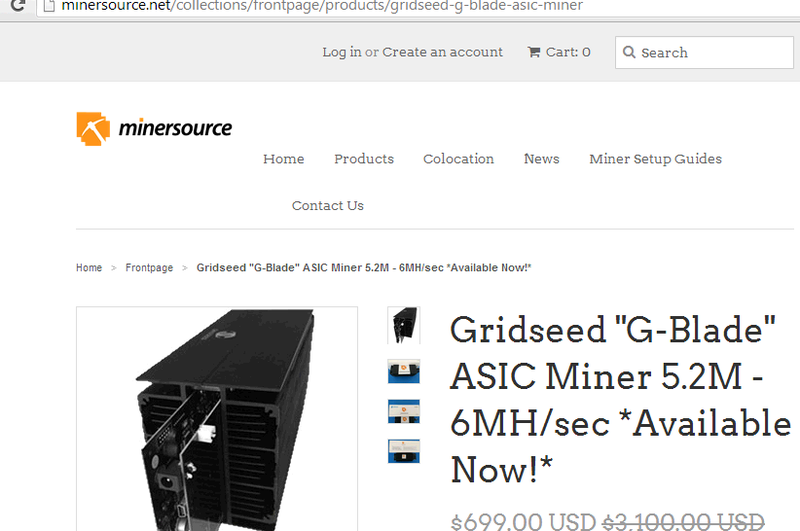 I placed an order for a quantity of 5 G-Blade scrypt miners, total of at least 26MH/s scrypt mining which is equivalent to what I have not with GPU, but the GPU just use way too much power doesn’t seem to be any profit to be make even with Bitcoin price rising, I would have to hold on to it for years or when it hit over $1k. Anyhow, I got an email today from minersource.net saying that they started accepting credit card, so I say wow, alright I feel more comfortable paying by credit card than Bitcoin or Wire Transfer, at least with credit card I can report fraud or bad business. I purchased the G-Blade, quantity of 5. As shown on this picture below. You will see the price if $699, and it said Available Now, but in the detail description you will see they say it’s a drop ship from another source, and they mentioned China. In addition I also print screen and save as PDF file on this item for future reference. So I added the the item into the shopping cart, quantity of 5, checked out, it took me to shopify.com which is the payment processors. Went through the process of entering my credit card total amount of $3,544.80 submitted but got kicked out! and immediately I received an email from my Credit Card Chase saying “Action required: Please confirm activity” so I confirmed it wasn’t fraud, and retried the check out process, it came through. About 15 minutes later I received a call from minersource.net, forgot her name, she just want to confirm my order, asking me a few question to validate my information. One thing is bother me is that, she said “you know this is order we don’t have this item in stock, it will get drop shipped else” then I ask them, how long would it take, I heard some talking in the background, she paused for a few seconds, and then answered “you will get it by next week” then I said that’s fine, no problem. So I’m hoping to get it by next week.